It is important to understand that we live in a wilderness area and if you are visiting Mono County and the Eastern Sierra, you are also in those wilderness areas. 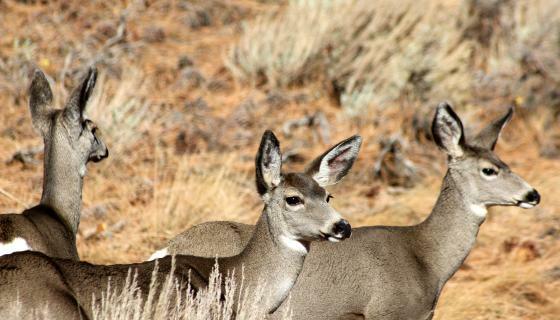 Bears, Cougars, Bobcats, Squirrels, Marmots, Deer and other animals also call the Sierra's there home, and it is important for locals and visitors alike to respect these animals. Probably the most popular animal that many visitors tend to be focused on, are bears. It is important to know how to safely hike and camp around bears, in order to prevent encounters. 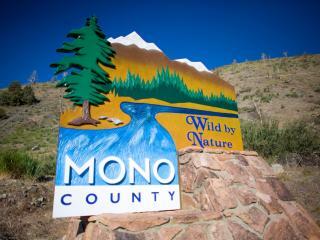 The goal of any wilderness area, and especially Mono County, is to keep wild animals, wild. This means that feeding, petting or touching of wildlife is prohibited. Feeding bears or other wild animals is not only extremely dangerous but detrimental to their health and well-being. Always remember, a fed bear is a dead bear. Never cook or store food in or near your tent. Keep the area clean. Make sure all foods and odors (toothpaste, deodorants, etc.) 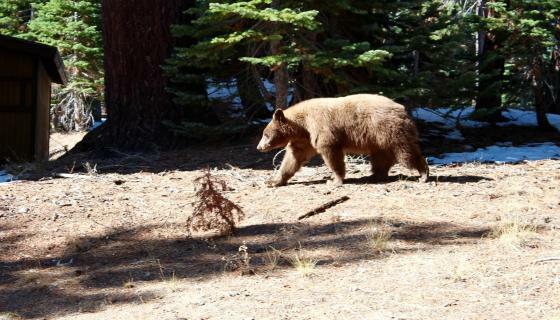 are put away in bear proof containers, such as canisters (available to rent at some Visitor Centers) or bear boxes (available at campgrounds and at most trailheads). Do not keep food or other items in your car. Bears, raccoons, or other wild animals will break into your car and damage it. Remember, a fed bear is a dead bear, and they are often times the ones penalized for our mistakes. Help keep wildlife wild by properly storing all of your camping items. Stay on marked trails and obey regulations of the area you are hiking in. For example, if there is a closed area due to bear activity, do not enter into the area. Please obey all signed areas and use caution. All food and other items that can attract bears must be stored in a bear proof canister. These can be rented or purchased at many local sporting goods stores and visitor centers. Counter-balancing is not effective and not allowed in most wilderness areas in the Eastern Sierra. Remain calm. Give the bear plenty of room and try to exit the area quietly so as not to disturb the bear and allow it to continue its activities. If the bear changes its behavior or notices you, then you are too close. Do not turn and run - simply back out of the area slowly and go around. If a bear sees you, then make it known you are human and not a threat. Talk in a normal voice and wave your arms. Remember that a standing bear does not always mean aggression; bears often stand to get a better view. Please, NEVER FEED OR THROW FOOD TO A BEAR. Black Bears are the only species of bear left in the state of California. 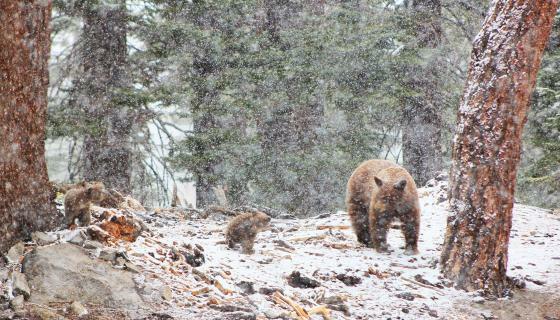 Prior to the 1800's, Black Bears were accompanied by Grizzlies in the High Sierra Nevada Mountains. Color: Black Bears are not always black in color. They can range from the traditional jet black color, to light blonde and brown. Many Black Bears have lighter patches on their chest as well. Size: On average, Black Bears weigh between 100-300 lbs. Large males can reach 400 lbs and can be larger than a female Grizzly Bear. Height: Black Bears are typically smaller than their Grizzly cousins with a height average of 2.5-3 feet at their shoulders and around 5 feet tall while standing. Shape: Black Bears do not have a hump on their backs and will have a straighter line from the crest of their heads, sloping downward towards their tail. Face: Black Bears have a straight line that runs between their forehead and the tip of their nose. They also have large, pointed ears and are less rounded than that of a Grizzly Bear. Prints & Claws: Their claws are shorter at about 1.5 inches on average and their prints will have a large toe arc. Toe imprints will be farther apart and the claws usually don't leave an impression in the ground.